Delivery service Flowers.ua provides around the clock delivery fee of flowers to Kremenchug. Order flowers with delivery to Kremenchug through our site and bring your loved, colleagues or partners unforgettable impression! For making order for flowers to Kremenchug you can use our catalog, or contact us by phone or . Send flowers to Kremenchug can be completed with a beautiful soft toy or a box of chocolates. Flowers in Kremenchug also can be accompanied by a free postcard. Making order for flowers in Kremenchug will take several minutes. Buy flowers in Kremenchug on our site quickly and easily. Florists of flowers internet-shop Flowers.ua able to collect floral arrangement at your request (you want some extraordinary bouquet of flowers, which is not in our catalog). Our courier service will ensure delivery the bouquet in Kremenchug on time. Flowers delivery to Kremenchug takes place 24 hours a day. Online flower shop Flowers.ua offers you the best gift of nature - flowers. On the page Flowers delivery in Kremenchug you can find a lot of flowers bouquets, flower arrangements for everyone’s taste. Flowers from online flower shop Flowers.ua is an endless waterfall of bright emotions. 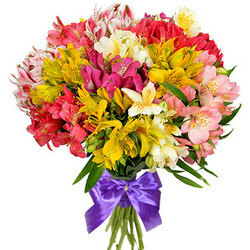 Sending bouquet of flowers in Kremenchug added with gift to your behalf, couriers pass your congratulations and good humor. You can convey the whole range of human feelings and emotions with the help of flowers in Kremenchug. Can you imagine the first date without a fresh and fragrant red roses? Flowers are given as a gift not only on dates, but simply as a sign of attention or to set good mood. Because flowers always express your warmest feelings, no matter how far away you are from each other. The most beautiful bouquets of flowers in Kremenchug for loved ones, relatives and friends close to you choose here. The page Flowers delivery in Kremenchug shows flowers that you can order in Kremenchug. Make an order for delivery of flowers to Kremenchug just in a few minutes and try any convenient way of payment. After that online flower shop Flowers.ua will send flowers to Kremenchug as soon as you want. Each recipient, who is presented a fresh bouquet of flowers in Kremenchug, will be full of happiness taking gorgeous roses, irises, daisies, chrysanthemums or alstroemerias. Flowers will be pleased your loved one who is far away from you, maybe in another city or totally on other parts of the globe. Add to the flowers in Kremenchug personal card, toy, fruits or sweets to make gift more meaningful, and close person highly appreciate your warmth and care, no matter how far you are from each other. All flower bouquets are made by professional florists, according to the latest trends of floral art. The most amazing and luxurious flowers in Kremenchug presented in our section Flowers delivery in Kremenchug. Nowadays, floral art develops, so florists Flowers.ua create new designs of bouquets to keep pace with the times. Online flower shop Flowers.ua follows modern trends and takes them into consideration them preparing flowers bouquets in Kremenchug. We guarantee the exceptional quality of flowers, timely Kremenchug flower delivery.